Nick Fury to Return in Captain Marvel? The Marvel Cinematic Universe can be a complicated place to keep track of, with so many characters bouncing in and out of various films. One of the major players is Samuel L. Jackson's Nick Fury, who was first introduced in the now-infamous post-credit scene in the very first MCU movie, Iron Man. Fans last saw Nick Fury in 2015's Avengers: Age of Ultron, although he skipped out on Captain America: Civil War and Doctor Strange. There are rumors he may be appearing in Thor: Ragnarok, though that seems unlikely since most of the movie is believed to be set in the cosmos. Surprisingly, the actor revealed that his beloved Nick Fury character actually won't be showing up in Black Panther. Instead, he'll probably be making his presence known in Captain Marvel. And he's definitely in Infinity War. Black Panther recently started filming, but when the full cast list was unveiled last month, Samuel L. Jackson's Nick Fury character was nowhere to be found. While promoting his upcoming action-thriller Kong: Skull Island, Samuel L. Jackson spoke with We Got This Covered, where he was asked about the possibility of starring in his own Nick Fury movie, and whether or not he's in Black Panther. While the actor himself was quite surprised about the studio not bringing him in for Black Panther, he did hint that Nick Fury may pop up in Captain Marvel. "Yeah, I'd love to do a Nick Fury movie. I'm always open and game. But they got Infinity Wars, two movies to do there, and after that there's Brie Larson's movie Captain Marvel, which maybe [Nick] will be part of. Also, I asked them, 'So you're doing Black Panther and the only black character in the Marvel Universe is not showing up?' And they're like, 'Nick Fury is not in Wakanda!' How can he not know the other black superhero on the planet? How the hell does that work? But they just said, 'No you're not in that one.'" 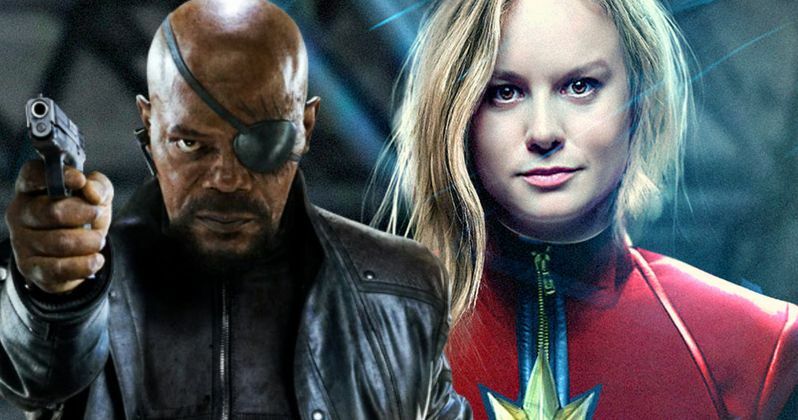 Samuel L. Jackson's Nick Fury will return in Avengers: Infinity War, and it has also been confirmed that Brie Larson will make her MCU debut in that movie, which explains why she was cast so early, since Captain Marvel doesn't hit theaters until March 2019. It's possible there may be an interaction between Nick Fury and Captain Marvel that will pave the way for a Nick Fury appearance in Captain Marvel, which is being written by Nicole Perlman (Guardians of the Galaxy) and Meg LeFauve (Inside Out). The project doesn't have a director at this time, but there have been reports that the studio has narrowed their choice for a director down to three candidates, Niki Caro, Lesli Linka Glatter and Lorene Scafaria. However, Niki Caro just signed on to direct Disney's Mulan remake, so she's likely out of the hunt. Samuel L. Jackson also revealed last year that he only has two more movies on his nine-picture Marvel Studios contract, and with the actor appearing in Avengers: Infinity War, that means he could make Captain Marvel his last movie, which means he wouldn't be featured in the untitled Avengers sequel that is slated for release on May 3, 2019. It's also possible that he could sign an extension with Marvel Studios to appear in more MCU movies, but it isn't clear if an extension is currently on the table or not. Hopefully we'll learn more about when we'll see Samuel L. Jackson's Nick Fury next in the near future.